The Moonite gets the job done as a smallish midrange option with creature comforts and an attentive staff. Average rating 8.1 from 448 reviews. The four-storey light grey building is rather plain, with nothing very “boutique” about it, but designers did pull off a sense of sophistication. Accessed by a lift, rooms are decked out with firm beds, good-quality linens, widescreen satellite TVs, desks, minibars, safes, hair dryers and squeaky clean bathrooms with rain-showers in addition to moveable shower heads partitioned behind glass doors. Colourful abstract art adds a splash of colour to rooms that otherwise feature a lot of white, grey and tan. The cheapest “mini rooms” are cramped, with beds on low wooden platforms. The “medi” and “maxi” rooms are worth the extra 200-400 baht for the additional space, while good-value suites come with wrap-around sofas in separate living rooms. The included breakfast is served in a bright ground-floor cafe. Just past the British and Swiss embassies on leafy Withayu (Wireless) Road, the quiet location puts you within a 10-minute walk of Pratunam and the Skytrain at Chid Lom or Phloen Chit BTS stations. Khlong boats can be caught at neighbouring Wireless pier. If you want something a bit cheaper and closer to the skytrain, you could do worse than Golden House on a tiny alley off Phloen Chit Road. 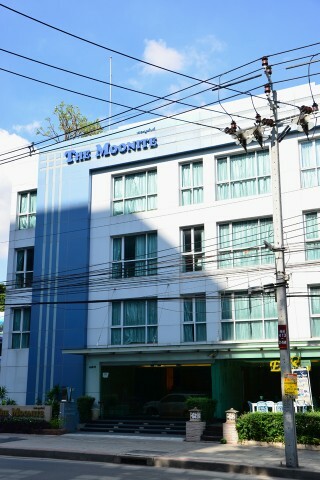 Check rates at The Moonite Boutique Hotel on Booking.com. Where are you planning on heading to after Siam Square? Here are some spots commonly visited from here, or click here to see a full destination list for Thailand.